Today, we are continuing to look at the cycle of blessing that comes into our lives when we practice thankfulness. Last week we started this by discussion the Law of Recognition. If you missed last week, go back and read that blog or listen to the podcast, Success Made Simple. Continuing with the theme of THANKS & GIVING, I want to give you a few thoughts about gratitude that I believe will benefit you. First, your attitude will determine your altitude. I personally speak several languages…American, English, Canadian, Australian, a bit of Ebonics…but whenever I am visiting a non-English speaking country, there is one word that I always learn…THANKS! Merci, Gracias, Arigato, Danke, Tiramisu! I have discovered that this one word alone will work wonders. It will open doors. It will establish relationships. It will make people realize you recognize their effort, and it will make you memorable. Learn the power of the word THANKS. Shortly after the release of the unkind article, a reporter approached Kipling at a gathering and said, “So you’re worth a hundred dollars a word? Here’s a hundred…give me a word.” Then he handed him a paper and pencil. Kipling took the hundred, put it in his pocket and he wrote one word on the paper…THANKS. 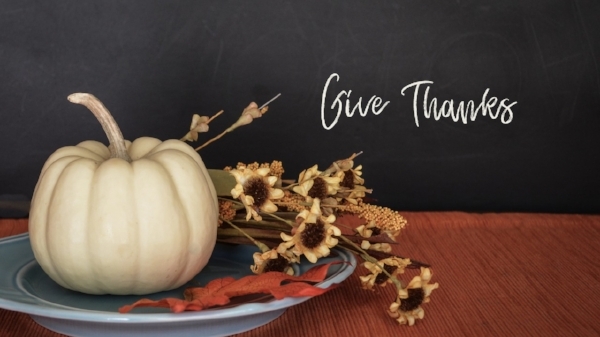 The Attitude of Gratitude has two perspectives – Outward Expression and Inward Thanksgiving. What we know within ourselves - that we are blessed. Gratitude means the quality or feeling of being grateful or thankful. Demonstrating sincere gratitude takes energy and thought, and having an attitude of gratitude requires the conscious effort of being thankful. 1. You start appreciating what you have instead of dwelling on what you don’t have. This means that you stop comparing yourself to others – what they have (or what you think they have), what they do, and what is done for them. To compare is to kill your joy. Stop doing that, and be thankful for what you have. 2. You’ll have more peace and joy because your point of view begins on a positive note. Your outlook makes all the difference. People who are thankful and content are a joy to be around. On the other hand…people who are crabby, critical and constantly complain…. are not truly grateful people. 3. You’ll also handle challenges differently if you begin with an appreciative mindset. Once you begin to live in gratitude, your difficulties are seen in a different light. Thank you God that they’ve discovered it early. Thank you that we’re living in a time where there are all kinds of potential treatments. Thank you that my friend has the faith to carry him through. Saying “thank you” isn’t tough for most people. Modeling a spirit of gratitude takes much more effort, and a shift in thinking is the first step. People who model gratitude don’t take others for granted. They don’t make assumptions about how other people should treat them or what others should do for them. They don’t walk around with a sense of entitlement, feeling they are owed more from the world.Sometimes we get so focused on our “rights” that we forget to be gracious and appreciative of what we really do have. When modeling gratitude, we develop an awareness by appreciating small everyday experiences. For example, you might be quick to complain when traffic stalls, making it hard to get to work on time. However, do you appreciate days when all the lights seem to work in your favor? Frustration comes from unmet expectations, but gratitude results in not having expectations and truly finding the joy in whatever comes your way. This is not a typical thought process for many of us; however, modeling gratitude will attract others to you and improve your overall attitude. Children who observe grateful parents learn to be thankful. Bosses who demonstrate a spirit of gratitude will find that their employees are more grateful. You might be thinking, “children should behave,” and that’s true. But demonstrating gratitude for their good behavior will only promote more of the same. * When someone does a job well. I have tracked down managers to let them know when a store clerk treats me kindly or just has a great attitude. I try to express my gratitude in front of the employee with the manager to ensure the employee hears it. If you have a housekeeper or lawn service, add extra payment or treat them to home-baked cookies occasionally to express your appreciation for their continued good work. I have a friend who leaves soda and snacks on top of her trashcan for the garbage collectors each week. Who thinks to thank the garbage collector? * When your spouse goes to work every day. It’s so easy to accept the benefits of your spouse’s income without ever really saying, “I really appreciate how hard you work for our family.” Even if your spouse doesn’t thank you for doing the same, be the bigger person. You might see a change of attitude. * When friends or family members help you out. It’s especially easy to overlook close friends and family when it comes to being gracious. We get so used to some people being there for us that we can’t imagine them not doing so. Maybe a friend picks up your daughter from dance, or your sister babysits your children. Think about those people in your life who are there in a pinch or regularly make your life a little easier. When we start looking for reasons to be grateful, our outlook will begin to change. The genuine gratitude we express outwardly will always be the result of our INWARD THANKSGIVING. We must know that we are truly blessed. So learn the essential trait of thankfulness, then live it. You will be living a life of more – more happiness, more contentment, more blessings. Because thankfulness is the link between recognition and increase. This brings us to our other anchor point of GIVING. Next week, is our final week in this mini- series of THANKS & GIVING. Join me back here next week as we discover how GIVING brings meaning and fulfillment to life. I hope you enjoyed this episode! Please share it with friends and colleagues, or on social media. If you liked what you heard, I’d love it if you would leave a five-star review on iTunes here. Dave Martin is known as “Your Success Coach” and is the best-selling author of 12 Traits of the Greats and Another Shot. Dave travels the world speaking on wisdom, leadership and success. He is a mentor, an inspirational speaker, and a business leader. He also has annual passes to Disney World and a very small dog named Gucci. Dave shares timeless truths, teaches people how to have a successful life, and everyone except his wife says he’s a funny guy! Dave speaks frequently to corporations, colleges and churches. Thousands have invested in his personal coaching systems and participate in Dave’s free weekly development program called Success Made Simple. He is the is founder and president of Dave Martin International which champions principle-based coaching by connecting, encouraging and investing in business leaders, entrepreneurs, and anyone who desires to go to infinity and beyond! As a special thanks to you for being a part of our Success Made Simple Coaching Sessions you can now purchase The Another Shot Game Plan for only $97. That's a savings of $200! Just use the promo code ATTITUDE at checkout. Purchase my newest book Another Shot for only $20.